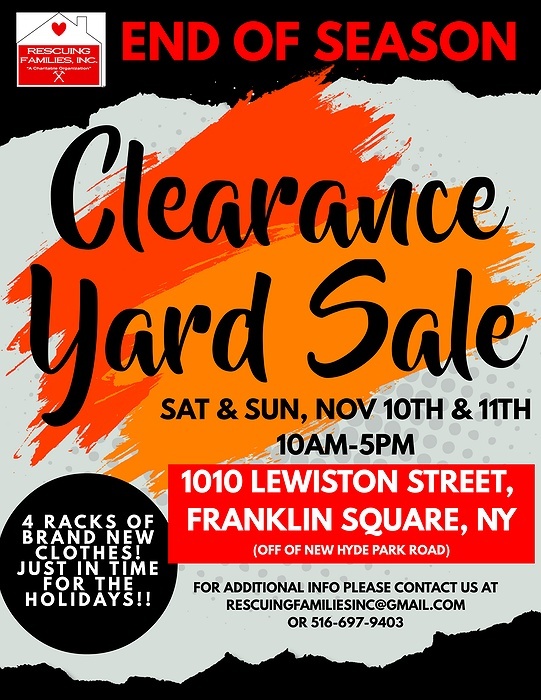 Subject: LongIsland.com - Your Name sent you Event details of "Rescuing Families End of Season Charity Yard Sale"
THIS IS OUR SEASON ENDING YARD SALE! STORAGE IS TIGHT FOR US AND WE CANNOT ACCEPT TOO MANY DONATIONS UNTIL THE SPRING SO WE ARE TRYING TO MAKE ROOM FOR ALL THE NEW STUFF NEXT YEAR! THERE WILL BE FLASH SALES GOING ON ALL WEEKEND ALONG ALONG WITH LOW LOW PRICES, A FUN RAFFLE AND REFRESHMENTS AT THE SALE! EACH DEPARTMENT IS FULL OF AMAZING ITEMS! WE HAVE SOME BEAUTIFUL FURNITURE, BABY ITEMS, CLOTHES, COLLECTIBLES, BOOKS, HOME DECOR AND SO MUCH MORE! IT'S 1500 SQ FT OF SALE!!!! DON'T MISS OUT ON THE CHANCE TO PURCHASE SOME OF OUR BRAND NEW ITEMS JUST IN TIME FOR THE HOLIDAYS! WE HAVE 4 RACKS OF BRAND NEW CLOTHES, SHOES AND ACCESSORIES FOR YOU AT THIS SALE!!! YOU DON'T WANT TO MISS THIS SALE!!!! THERE IS NO RAIN DATE FOR THIS SALE THIS WILL BE THE FINAL SALE BEFORE NEXT YEAR!!!! ***BRING A NEW UN-WRAPPED TOY TO THE SALE & RECEIVE A FREE GIFT!! 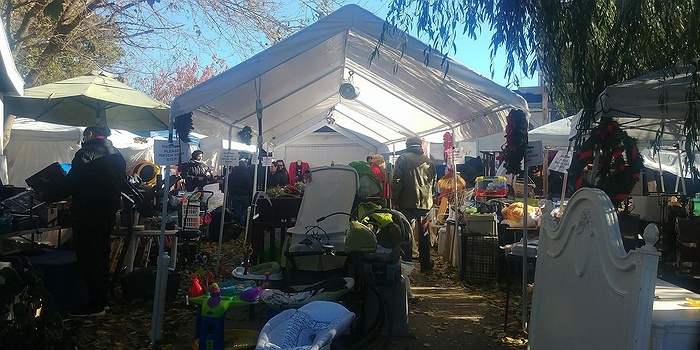 ***BRING YOUR UN-CARVED PUMPKIN TO THE SALE AS WELL FOR A FREE GIFT! WE ARE HELPING FEED THE FARM ANIMALS & HELPING GET SOME GIFTS TO THE KIDS THAT REALLY NEED IT FOR XMAS!! !